Winter warmer – a silent film night with a difference. It’s hard enough to get audiences out of the house and into a theatre in mid-winter, even harder to get actors there! With this in mind, we have changed our regular programme somewhat and turned our winter play into a one-night-only film night – less work for everyone, and hopefully both the audience and regular Onset members can kick back and have some fun. 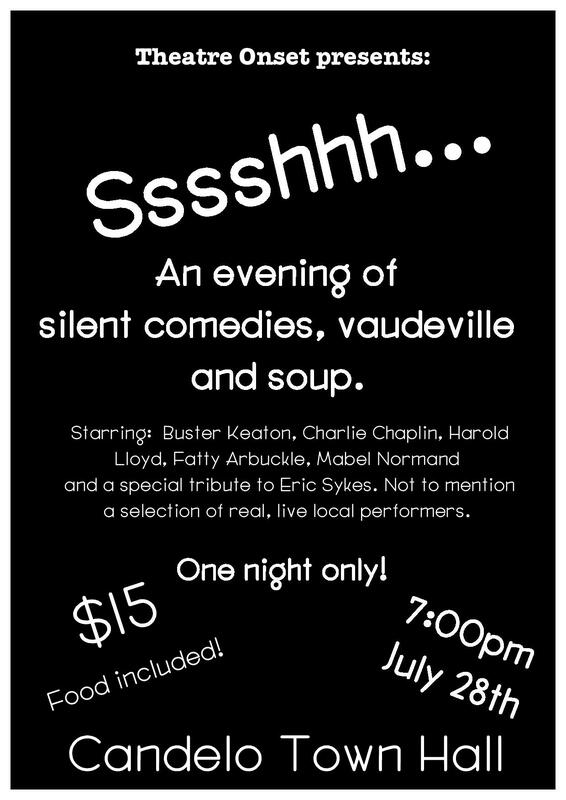 The evening will consist of a selection of short(ish) classic silent film comedies and live acts presented by Theatre Onset members and the odd ring-in. You will be wowed by Jamie Forbes, Alison Vandenberg, Alex Nicol, Peter White, The Great Zamboni and Leanne Suffren, presenting vaudeville style acts for your delectation, while your tummies will be tantalised by home made soups, bread (not homemade) and cake. 7:00pm at the Candelo Town Hall on July 28th.